BI in the Cloud. Is it a Viable Option? 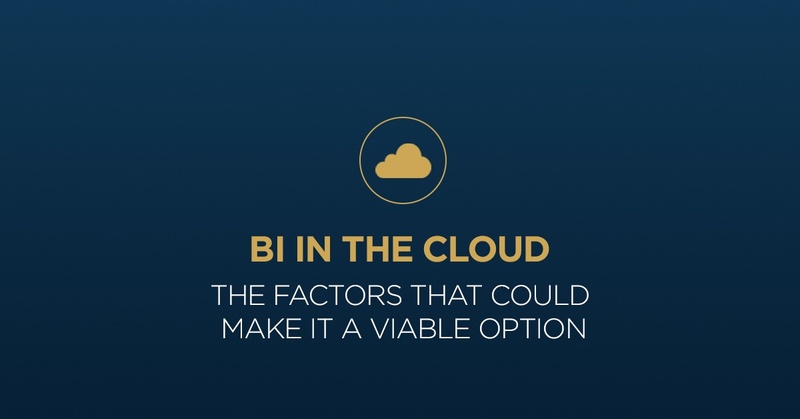 BI in the Cloud: A Viable Option in the Future? A few weeks ago I presented a full day course on BI in the cloud at the TDWI conference in Orlando. I was pleasantly surprised by the number of attendees and the overall interest in BI in the cloud from both vendors and BI practitioners. Having spent the better part of the past year working in the Amazon cloud, I took for granted the general confusion that still exists over how the cloud is defined and how it relates to BI. I believe that this is due in large part to the fact that the cloud is still taking shape, especially when it comes to BI. As an industry, we look at the expectation of large data volumes, a seemingly endless desire for faster response times and concerns over data security and wonder how BI infrastructures could possibly exist in the cloud. Given the fact that we are at the early adopter phase of the consumer lifecycle, these concerns are expected. However, these concerns may not be reality for as many BI programs as some might think. I recently met with a data warehouse developer who mentioned the same concerns and questioned whether BI in the cloud would ever be viable. I asked about the data volumes in their program and the type of data that they were integrating. They were warehousing 3rd party prescription data, had approximately 100GB of data and indexes across their architecture and growing by less than 20GB per year. While there may be some compliance issues to consider, based on my experience, they would likely be a great candidate for moving some or all of their architecture to the cloud and being one of the early adopters to BI in the cloud. While not all BI programs are candidates for implementing Software-as-a-Service (Saas) or Infrastructure-as-a-Service (IaaS) for their BI architectures, it is a viable option for many. However, cloud vendors will need to do a better job at educating the public about their physical infrastructures, service level agreements, pricing, standards and security before more BI programs will consider BI in the cloud as a viable option.